A series of leaks have emerged online for AMD’s upcoming Raven Ridge “Ryzen + Vega” APUs, which will see a launch date of February 12th, 2018. These upcoming products are built using the newer 12nm architecture, rather than the older 14nm node found in the current Ryzen 1000 series CPUs. This advancement in architecture is one of the primary things separating the Raven Ridge lineup from the currently available Ryzen SKU’s on the market. The other differentiating factor is of course, the on-die Vega GPU. Given the pricing for these chips is pretty competitive (particularly given the inflated prices of graphics cards right now), it’s a safe bet for those wishing to put together budget gaming systems (or small form factor builds) will certainly find these Raven Ridge processors appealing. For specifications and pricing the Ryzen 5 2400 G, which features 4 cores (and 8 threads thanks to SMT), 11 Compute Units, and a 3.9GHz max boost will cost about $170 US Dollars. The chip has 8MB cache, and the graphics clock is 1250 MHz, which should mean a max TDP of ‘just’ 65W. The lower end Ryzen 3 2200G SKU, with no SMT (therefore only 4 threads), a slower 3.7GHz boost, and only 8 Compute Units is going to cost just $99 USD. The chips 512 shaders are running a little slower, with only 1100Mhz brought to the party. 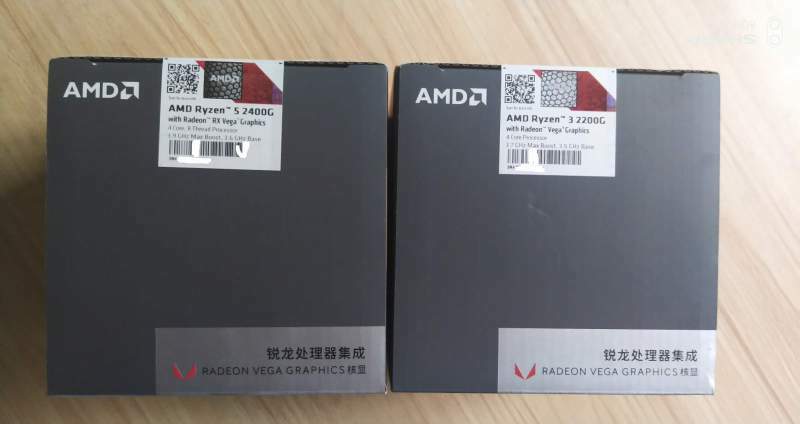 The only slight negative towards these Ryzen + Vega processors is that if you’re running them on an older AM4 motherboard (such as a B350 or X370 board) there’s a good chance you’ll need to perform a bios update first, so be careful when purchasing parts if you don’t have a Ryzen processor you can borrow ‘just in case’. So now we’re all caught up – what information do we have? Well, both performance numbers and packaging has found its way online. 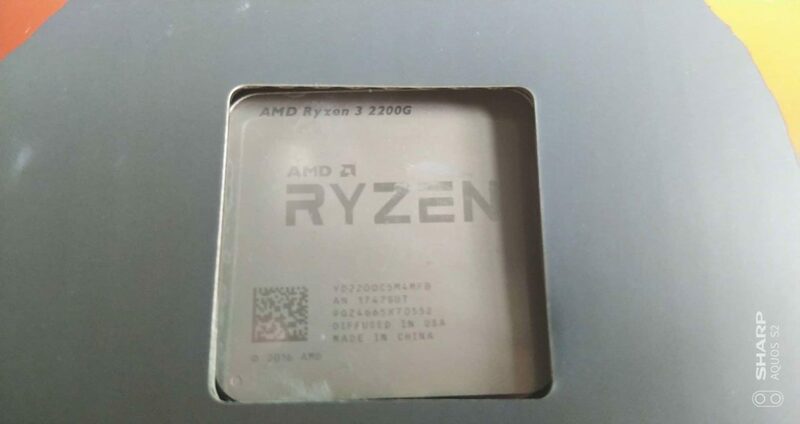 We’ll start things out with the packages for the processors – and honestly, if you’ve ever seen a Ryzen retail box, it looks very similar – albeit with the silver streak denoting “Vega”. Mercifully, these processors are also bundled with a Wraith Stealth cooler, which should be sufficient for most users unless you decide to really try and crank up the clock speeds. These leaks originated on the Chinese forum Baidu, although they’ve since been removed. 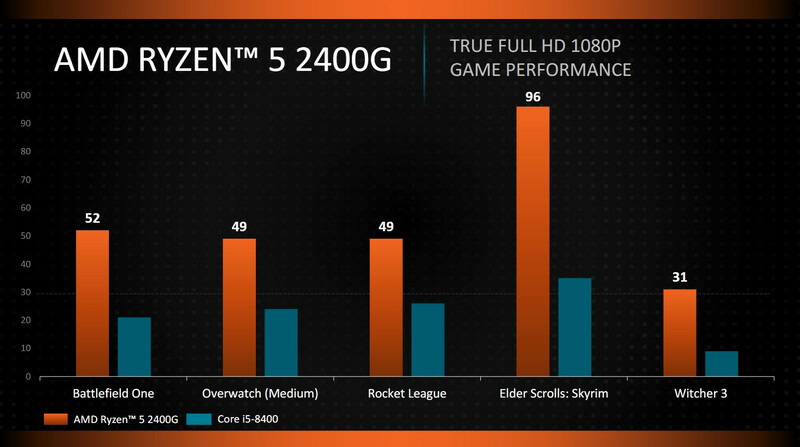 So, with a score of the Ryzen 5 2400G, the performance of graphics score is just peaking over 5k, or to put that into a different perspective, sitting between a RX 550 or RX 560 discrete graphics card. Assuming these performance numbers continue a similar trend between the 3dmark 11 scores and ‘real’ games, we should be looking at a chip capable of playing lighter titles such as MOBA’s, Counter Strike and other popular LAN games rather happily at 1080P, or more demanding titles at either lower frame rates or with concessions in the LOD. These performance leaks appeared thanks to a YouTuber known as Tum Apisak, whom somehow grabbed hold of these different chips. 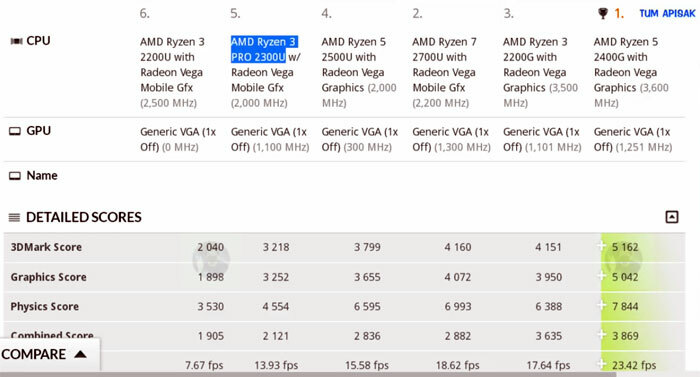 According to AMDs own performance numbers, it would appear that Ryzen + Vega APUs should indeed be capable of putting out that level of performance, with Witcher 3 quite playable at 30 FPS (about console level of performance), while the Overwatch on Medium quality at 1080P is hovering just 1FPS under 50. It’ll be interesting to see how well these processors overclock, between the CPU side of things, as it might offer us a glimpse to the potential changes for the Ryzen 2000 series, also based on the 12nm process, featuring the Zen+ cores. These processors won’t hit store shelves until April this year, along with the Pinnacle Ridge platform, known as the 400 series motherboards. Tagged with 12nm ryzen, benchmark, ryzen 3, ryzen 3 2200g, ryzen 5, ryzen 5 2400g.